Meyer Lemon & Honey Marmalade for sale. Buy online at Zingerman's Mail Order. Gourmet Gifts. Food Gifts. It ain’t easy to stand out amidst the growing crowd of really good preserve makers out there, but Blake Hill from Windsor, Vermont is doing just that. 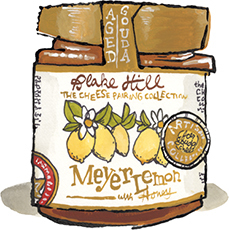 Founded by British ex-pats, these English-style marmalades are made with lots of rind, but instead of bitterness, this Meyer Lemon version is soft, sweet, complex, and bright. Their secret is the extra step of infusing the delicate slices of lemon with raw honey. This soaks up the sweetness and balances the bright acidity of the lemons. Even if marmalade isn’t your thing, this luscious spread could change your mind.